As per the modern western astrologers, Aquarius sun sign is dominated by the ruling planet of Uranus. As far as the Greek mythology is concerned, Uranus was believed to be the personification of the heavens and the night sky. 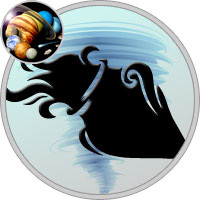 One of the unique traits associated with the Aquarian zodiac sign is that unlike the other planets, it rotates on its sides. The result is that one of its hemispheres is practically bathed in light, while the other is immersed in darkness. It remains surrounded by blue - green clouds, which astronomers have not been able to penetrate till date. It takes approximately 84 years for Uranus, discovered only in 1781, to orbit the sun. This means that, on an average, it spends about 7 years in each sign of the zodiac. The planet is associated with the principles of genius, individuality, new and unconventional ideas, discoveries, inventions, and the beginnings of the industrial revolution. Some of the astrologers believe the planet to be the co-ruler of the 11th house, along with Saturn. Qualities of revolution, change, unpredictability and disruption are also connected with it. Uranus is thought to rule the circulatory system and ankles. The items that are associated with it include ash, birch, cherry, fig, plum, rowan, apple, lemon and peach blossom and orchid. The lucky colors for those born under the Aquarian sun sign are Aquamarine, Electric Blue and Turquoise tones. The main stone associated with the planet is the Aquamarine and the closest metals are aluminum and uranium. The lucky number for Uranus ruled people is four and the lucky day of the week is Saturday. Aquarius is the sign of friendship, and chances are, you’ve got plenty of pals. Although you may look like the boy/girl next door, you love to be around unusual people and ideas. You know how to step back and find the perfect solution to any problem. And you can make friends with almost anyone! Aquarius rules surprises and originality, and you love to shock people. Just when they think they’ve got you figured out, you change the game. Practical jokes are your specialty. People love to be around you, because you’re so accepting and fun. Remember to give some of that love to yourself, too. You make a great leader and can really stand out from the crowd. Your sign is ruled by Uranus, planet of revolution and electricity. Aquarians are ultra-modern, always into the latest gadget or concept. Like unpredictable Uranus, your temper can flare out of nowhere. When you’re upset, Aquarians can deliver a trademark lightening bolt that strikes with a force shocking even to you. The ruling planets for Aquarius are Uranus and Saturn.